September is almost over, and we spent most of it traveling through China and Taiwan for our respective jobs (the ones that actually pay so we can afford to eat and drink). September marks the beginning of fall and is also the time for honoring National Bourbon Heritage Month. This month-long celebration was officially started in 2007 when the United States Senate passed a bill to honor the legacy and heritage of the American-made whiskey. We’ve been doing our share of drinking some of our favorite brown spirits during this month (Bourbon choices are somewhat limited in Asia), but thought we’d get in a last minute post with a couple of Bourbon Buck recipes to help celebrate. We returned from hot and humid Asia to a heat wave here in the Bay Area, and we’re definitely experiencing the beginning of Indian summer — typically the best weather of the year — just the perfect time to drink a Bourbon Buck cocktail. A Buck cocktail is generally a spirit (vodka, gin, whiskey, rum, etc.) mixed with ginger ale/beer and citrus juice (many will recognize the vodka version as a Mule). We’re posting a couple of variations using grapefruit in the first version and lime in the other. 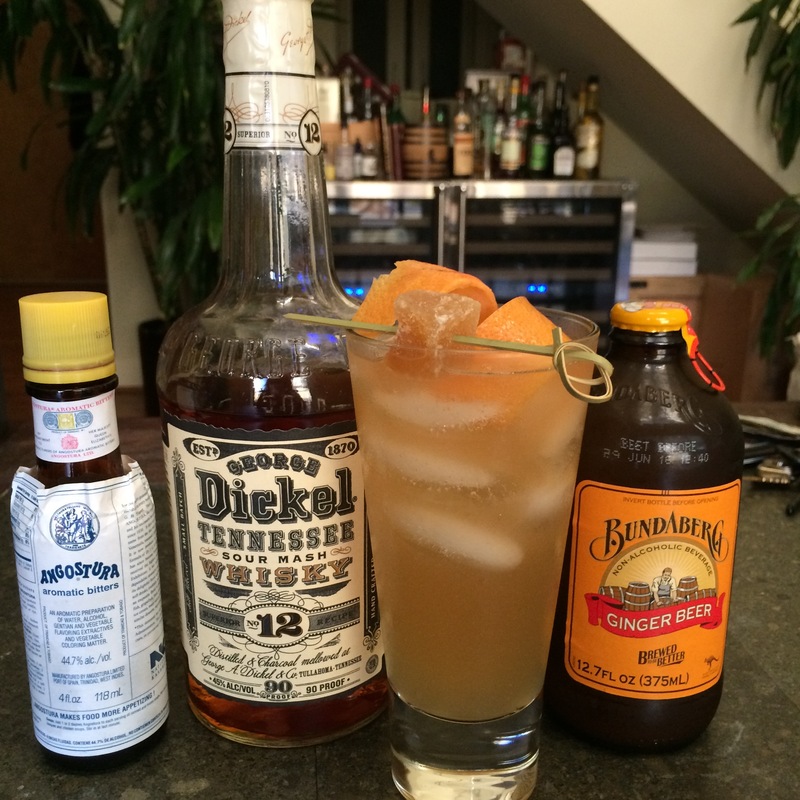 This first version is made with grapefruit juice, which we find pairs well with the spicy notes of the Dickel No. 12 Sour Mash. OK, technically this Dickel is not a bourbon but it’s close enough (wink wink). 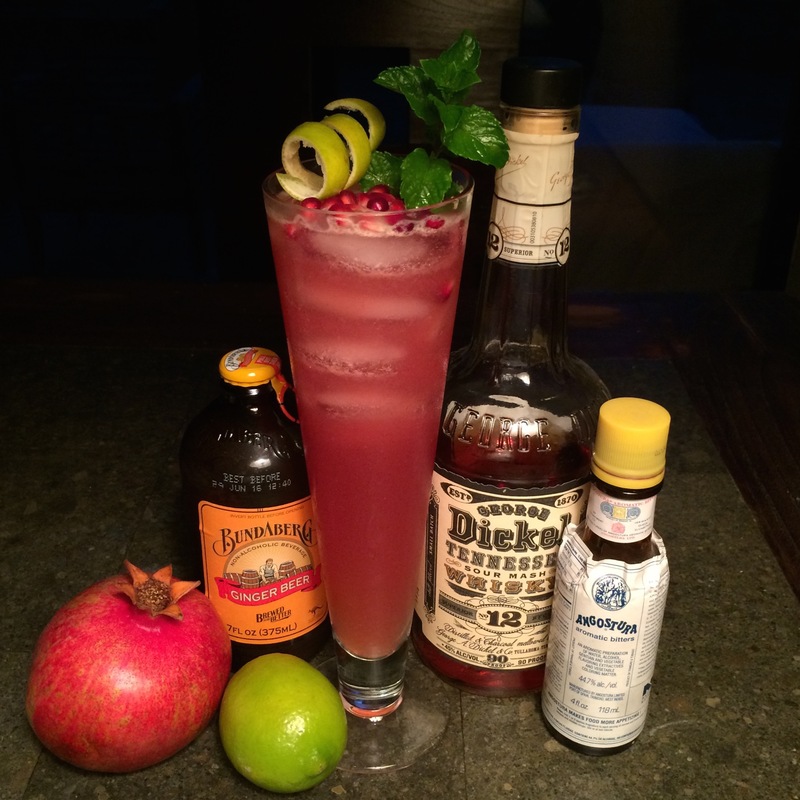 Add the Bourbon, grapefruit juice, syrup and bitters into a shaker or mixing glass and stir contents to combine. Strain mixture into a Collins (or highball glass). Fill the glass with ice then top with ginger beer. Garnish with a grapefruit rind and candied ginger (optional). We decided to make a version with a seasonal fruit, and pomegranates are very much in abundance now. We received a few from the BarFly’s sister who grows them in her yard, so we decided to put one to good use. It’s a little more work than the typical Bourbon Buck, but the end result is very much worth the effort. Add pomegranate seeds, lime juice, simple syrup and mint leaves into a mixing glass. Do it the easy way and use an immersion blender for a few seconds to mix, or do it the hard way and hand muddle all the contents. Using a fine mesh strainer, strain the mixture into a Collins (or highball) glass using the back of the spoon against the arils to extract all of the juice possible. Add the bitters, fill the glass with ice and top with ginger beer. Garnish with a lime twist, mint and pomegranate seeds (optional).